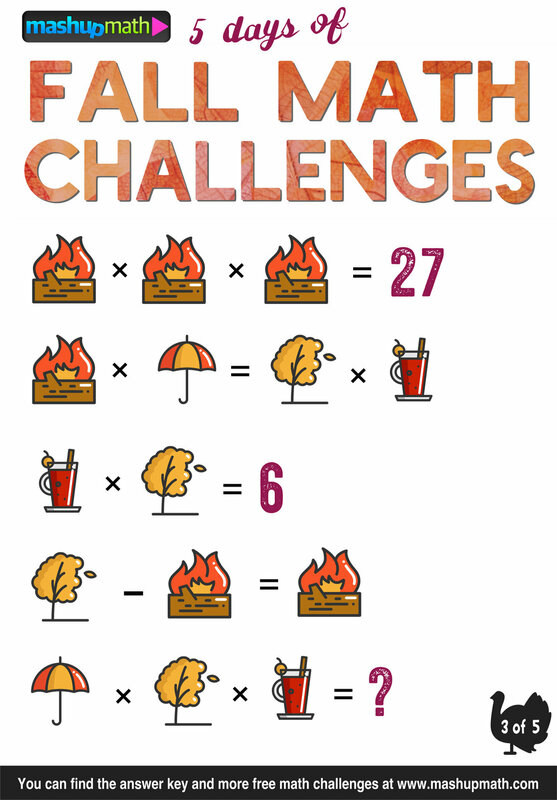 Are Your Kids Ready for 5 Days of Fall Math Challenges? Are you looking for some fun seasonal math activities to keep your students focused on learning math this November? Crafty math teachers know how to channel their student's excitement into holiday-themed activities during this time of year. And since preparing materials is time-consuming (and you're already so busy this school year as it is), my gift to you this fall is 5 Days of Fall Math Challenges! The following printable Fall Math Worksheets allow you to inject some seasonal mathematics into your lessons this month. Each worksheet shares a challenge question (answers are included) appropriate for all elementary and middle school grade levels - they are perfect for warm-ups, exit tickets, and homework and extra credit assignments. Parents can also share these fun challenge questions with your kids to keep them engaged and thinking mathematically this fall. Download Instructions: You can download any of the challenges by right-clicking the image and saving it to your computer or by dragging-and-dropping each image to your desktop. *-thank you to Ms. Winderman’s 3rd graders for finding the correct answer! 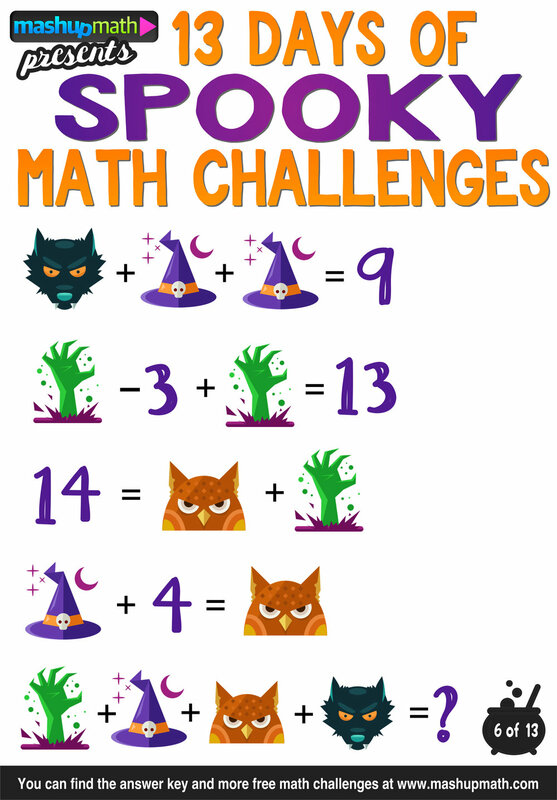 Are Your Kids Ready for 13 Days of Spooky Math Challenges? 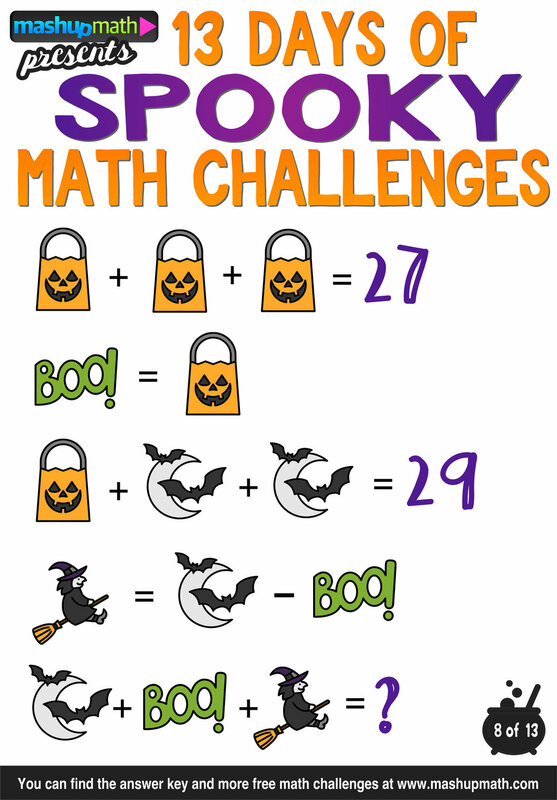 Are you prepared to keep your students focused on learning math during the excitement of the Halloween season? Sometimes it takes more than an extra shot of espresso in your pumpkin spice latte to get the job done and savvy math teachers know how to channel their student's excitement into holiday-themed activities. And since preparing activities cab be time-consuming (and you're already so busy this school year as it is), my gift to you this Halloween season is 13 Days of Spooky Math Challenges! 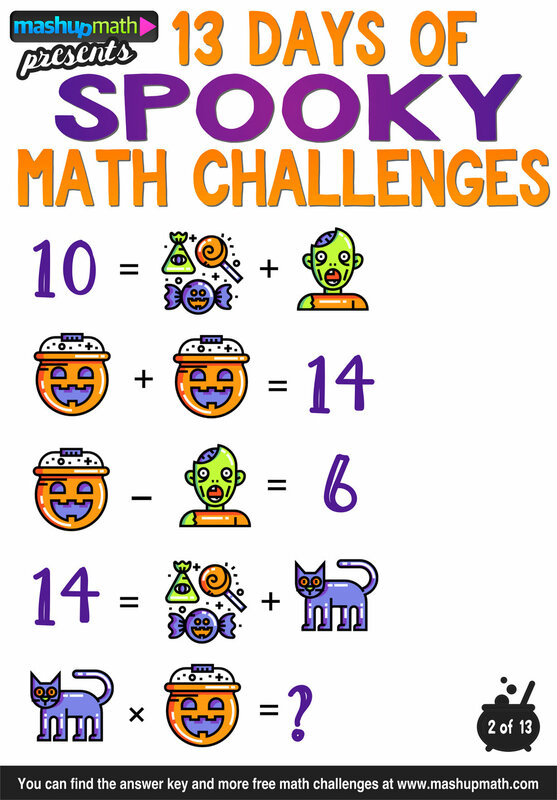 The following printable Halloween Math Worksheets allow you to inject a little bit of spooky mathematics into your lessons this month. 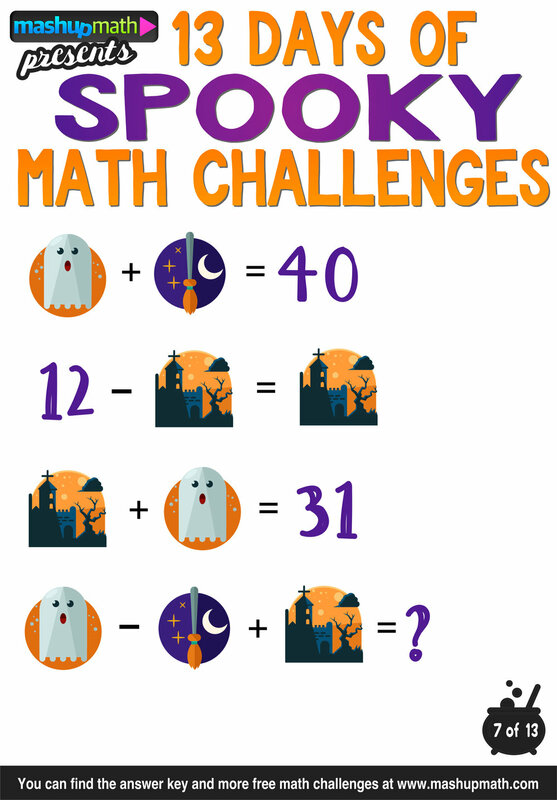 Each Halloween Math Worksheet shares a challenge question (answers are included) appropriate for all elementary and middle school grade levels - they are perfect for warm-ups, exit tickets, and homework and extra credit assignments. Do YOU want free math resources, lesson activities, and puzzles and games for grades 1-8 in your inbox every week? Join our mailing list and start getting tons of free stuff (including a free PDF eBOOK)! My best-selling workbook 101 Math Challenges for Engaging Your Students in Grades 3-8 is now available as a PDF download! Notice that the first value increases by 2, the second value increases by 3, the third value increases by 4, etc. *This question was inspired by Jo Boaler's TED Talk: How You Can Be Good at Math and Other Surprising Facts About Learning. Save the tricks and the treats (except for the bite-sized Twix bars - those I'll take), I just want your input. Please (oh please, oh please) share your thoughts in the comments below!